The Simon Actuarial Science Lecture aims to strengthen Michigan State University’s Actuarial Science Program by connecting students, faculty, alumni and industry leaders in actuarial science for an evening of scholarship and community. Whether you are a current or prospective student, a potential employer or just a friend of the program, this website will provide you with information you need about the actuarial science (AS) program at MSU. Although our AS undergraduate major was just established in 2012, it is already becoming known for delivering quality education and academic research, and is receiving increased attention from potential employers, academics and students. Because of its interdisciplinary nature, the program is housed in and supported by both the Department of Mathematics and the Department of Statistics and Probability in the College of Natural Science. Please feel free to explore the site to get the latest news and information about the exciting things happening in the program. If there is something that you cannot find, please contact us and we will be happy to assist you. 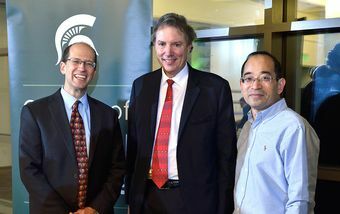 (L to R): Keith Promislow, current mathematics department chair; Kevin Clinton, former Actuarial Science Program director; and Yimin Xiao, statistics and probability former department chair, visit during the 2016 Simon Actuarial Simon Lecture.